Can Some Physical Agents Influence Development and Reproduction? Lightning is a physical agent that may have played a role in originating life. Lightning strikes are among the uncontrolled exposures to electricity that may endanger life, including that of a pregnant woman and her fetus. Ever since scientists began studying electric power, there has been interest in finding medical applications and identifying its possible health effects. Many of the early electrical therapies have been abandoned, but some have been refined and remain a fundamental part of diagnostic and therapeutic medicine, including electromyography and transcutaneous electric nerve stimulation. The possible developmental and reproductive effects of physical agents, including x-rays, MRI imaging, ultrasound, heat, and others that are listed below will be focus of this chapter. Electricity is the movement of electrons in a conductive material. Moving electrons, called a current, generate electromagnetic radiation. 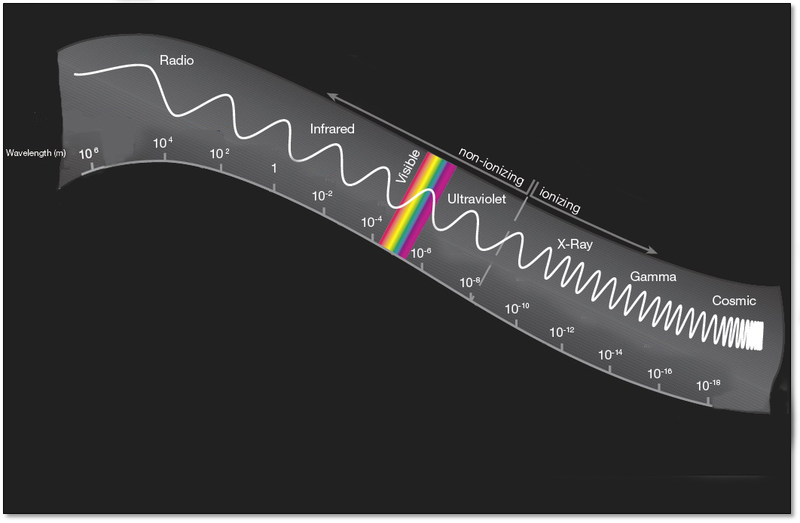 These radiations range in wavelength from the long-wave, low-energy radio waves through the visible light spectrum, to the short-wavelength, high-energy gamma rays (Figure 1, and http://www.lcse.umn.edu/specs/labs/glossary_items/em_spectrum.html). High energy electromagnetic fields remove electrons from atoms and are called “ionizing radiation.” Ionizing radiation is used to take x-rays and is the radiation (often gamma rays) used in radiation therapy. Wi-fi signals are transmitted using radio waves. Cell phones operate primarily using radio waves, but some emit radiation in the microwave spectrum. Metal detectors emit a fluctuating electromagnetic field in the non-ionizing energy range. Light is on the lower end of the electromagnetic spectrum. Humans have light sensitive skin and eye tissue (retinas) that, when stimulated, can affect levels of reproductive hormones particular through the pineal gland, a light-responsive organ near the optic tracts. The electromagnetic fields encountered in proximity to power lines, appliances, lighting, and other electric equipment are called extremely low-frequency fields. Sewing machines have been identified as one of the highest exposure sources of these fields in homes and factories. Research papers that look for associations between adverse outcomes and these types of electromagnetic field exposures are limited by the rapid field strength decrease with distance from a source. Few people and their offspring live directly below a power line, although those living close to power lines appear to reproduce normally. Experiments in animals have suggested that small pregnancy exposures to ionizing radiation do not produce measurable increases in birth defects. The amount of radiation used in diagnostic radiology, with some exceptions for fluoroscopic procedures, are all well below levels associated with risk, and new digital imaging techniques, which do not require making a shadowgram on a photosensitive sheet, use much lower exposures. The effects of radiation in the Japanese people who were irradiated in utero during the atomic bombings indicated any dose of bomb radiation between the 8th and 15th week of fetal growth increased the risk of microcephaly and cognitive impairment. Although there are scientists who suggested that any dose of atomic bomb radiation could have adverse effects on cognition, the prevailing view is that radiation thresholds exist that must be exceeded to have an effect on development. It should be kept in mind that the doses of radiation at Hiroshima and Nagasaki that produced cognitive impairment were uncontrolled radiation sources that differ significantly from filtered radiation used in diagnostic radiology. Women exposed to radiation in sufficient doses will have an increased risk of abnormal pregnancy and infertility. The dose needed to produce infertility is highest when a woman is young and has the greatest ovarian reserve. Human data on the effects of large doses of radiation on male reproduction were collected from clinical studies that involved radiotherapy and studies, now considered unethical, that used prisoners who received large defined doses of x-irradiation to the testes and had subsequent gonadal function monitored. In sufficient doses, radiation can destroy sperm and sperm-producing cells. In some cases the destructive effects are reversible, but in sufficient amounts ionizing radiation can make a man completely infertile. The magnetic effects of electric fields have been refined for use in magnetic resonance imaging (MRI). MRI uses a strong magnetic field to orient the nuclei of certain atoms. When the magnetic field is turned off, the nuclei release energy as they return to their original state. The energy is detected and used to create an image based on the distribution of atoms within tissue. Practice guidelines have been established for the use of MRI and adverse effects of MR imaging exposure on the developing fetus have not been identified. Special attention is given to metal implantable devices, including copper-IUDs, when women undergo an MRI, because metals may collect energy in the magnetic field and generate heat. Heat during pregnancy is exchanged between mother and fetus, and maternal core heating is required to heat the fetus. Excessive maternal heating, from any source, including hot baths and saunas or fever in the mother, has been associated with harmful effects on development that typically involve the heart and brain. Diathermy, a medical application involving microwave energy to heat tissues, is not used during pregnancy because of concerns about heating the fetus. The spectrum of non-ionizing electromagnetic radiation - in order of decreasing wavelengths - includes: 3 types of light: ultraviolet, visible, and infrared, then microwave radiation, and radio frequency waves. Microwave energy is used in radar. The incidental heating effects of radar led to the development of microwave ovens. When electromagnetic waves in the microwave frequency strike tissue, the transferred energy results in an increase in molecular motion, which is perceived as heat. The principle of microwave cooking is that the radiant energy increases the molecular motion chiefly of the water within the food. The resultant heat cooks the food. Additionally, indirect exposure to low levels of microwave energy has been an important topic in developmental studies because of the growing use of cell phones. Animal experiments with cell phone radiation that excluded the possibility of fetal heating have not shown any significant effects on development. Electromagnetic waves can be transmitted in a vacuum, but sound and other so-called mechanical waves require a medium, which is usually air or water. Mechanical radiant energy with a frequency greater than the upper limit of perception by the human ear is called ultrasound. High intensity ultrasound can have sufficient power to be used for drilling and welding. In medicine, ultrasound has been used for ablation surgeries. Less powerful forms of ultrasound are used for imaging (ultrasonography), telemetry (external fetal heart rate monitors and Doppler waveform flow monitoring), and other types of diathermy. Diagnostic ultrasound has not been shown to have adverse effects on pregnancy outcome. Pulsed or color Doppler ultrasound involves higher energies for which there is less information on pregnancy outcome. Concerns include tissue heating and the transmission of energy to oscillating bubbles within tissue. Human tissues are sensitive to vibrations. Before birth, the vibrations in a mother's voice and heartbeat play a role in infant development. There is no clear line to define when the vibrations in our aural or physical environment become “noise.” Two people can be watching a fireworks display and react with excitement or agony in the same environment. We can say that “noise” is unpleasantly stressful to experience and animal experiments and some human studies suggest infant growth might be impaired by this and other stresses. Stress is discussed in another chapter. Vibration can be found in some workplace environments and was associated in one study with an increase in preterm birth. Concerns about exposure to physical agents, including radiations and mechanical waves, center around the possible transfer of harmful amounts of energy to the developing embryo and fetus. A great deal of future work is needed to quantitate pregnancy exposures to physical agents and their potential effects on mothers and babies.